Yesterday I was working on a small project in Silverlight and I took the project on another PC. After working on the same project on another PC the Visual Studio keep freezing the PC. After some very frustrating debugging decided to have a deeper look at the problem an started too search for the process that was causing this. Then I realized that Internet explorer has his caching of debug files and libraries. After I have completely reset internet explorer all came to normal. 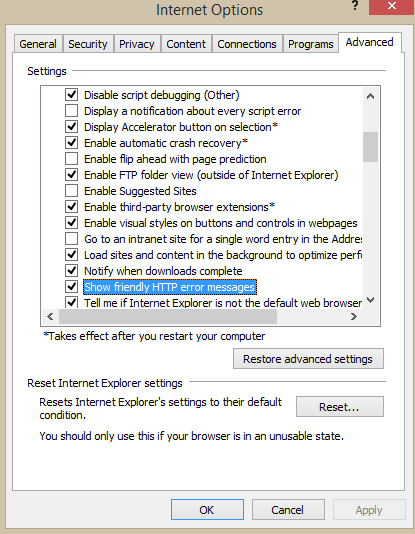 So if you ever have problems while debugging a Silverlight application or web application consider resetting the Internet Explorer. This entry was posted on August 15, 2013, 12:05 am and is filed under Uncategorized. You can follow any responses to this entry through RSS 2.0. You can leave a response, or trackback from your own site.